Should we debate whether another writer deserved the “honour” of the Nobel Prize in Literature more than Kazuo Ishiguro? Consider the nature of this particular distinction. 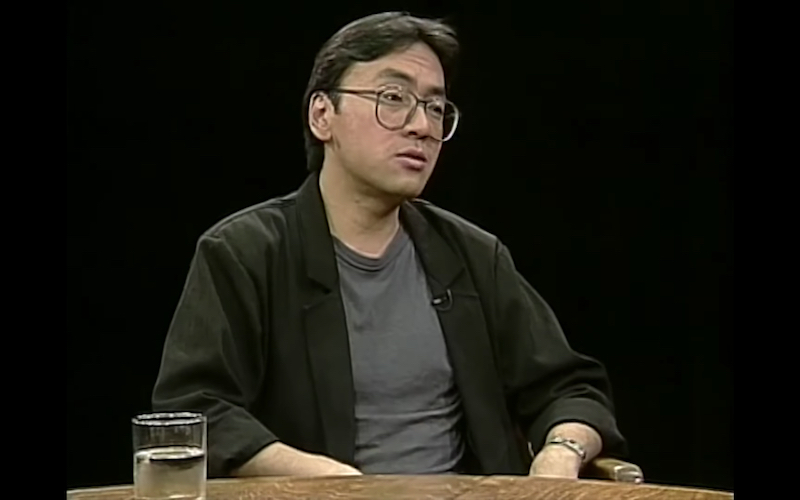 Kazuo Ishiguro on Charlie Rose, 1995. The Nobel is the premier institution of elite literary prestige, conferring authority on what is already taken to be worthy of acclaim within the literary field. To be sure, it is not a homogenous unchanging force. It has shifted with the times, as definitions of what constitute properly literary expression have shifted. To generalize, in the postwar period the prize has served to consolidate the literary as a manifestation of liberal reason, in which a high-cultural disposition is necessarily distanced, “balanced,” fair, disinterested, dispassionate contemplation of world events, and more embattled positions are avoided or denounced outright. Conferring the Nobel also solidifies Euro-American cultural power (members of the adjudication committee often have American graduate degrees), as the Nobel institution positions itself as naturally authorizing and emboldening, in its own dispassionate assessment, what is inherently worthy of commendation. It’s a classic case: an institution of elite cultural power that hides its biases in claims to universality. None of this is to say that the writers selected are in any meaningful way apolitical. On the contrary. At times writers have been selected whose works have an undeniably political content, and the prize committee has deliberately intervened in topical debates. The 2005 recipient was Harold Pinter, whose acceptance speech was an indictment of US-led wars and occupations and the distortions of language that seek to justify them. But the nature of the relationship between literature and the political sphere is conceived in only certain terms. Specifically, the literary is imagined as a privileged site of heightened commentary whose opposition to that which all enlightened humanists should oppose is taken for granted. Literature’s characteristic oppositional stance — against the status quo, against conservativism, against abuses of power — can come in for special mention at times, when the writer’s political stamp seems most apparent. What is obscured is the fact that literature is inherently politically positioned, determined, and also circumscribed. The most apparently apolitical literature arises from social relationships that are political through and through, and the most avowedly political work might be more flattering to its audience than socially important. Art and culture arise from, mediate, and manage social experiences, hierarchies, and bonds that are constitutively political. The social frameworks necessary for the production of literary writing have political meaning. The Nobel is not a prize for the writer’s supportive circle of friends, or for the underemployed instructors who assign Ishiguro’s work, or for people manufacturing books, or for the literary media that have a field day with prize announcements like this one. It exists to credit and highlight one individual genius creator who uses aesthetically sophisticated expressive forms to cast light on what we are meant to think is worthy of our attention, and to the concentrate the power to judge in the hands of a Euro-American cultural elite. Specifying what counts as worthy in literature has long been about asserting the dominance of the advanced over the elementary — elite, trained, highly educated expression being more valuable than common speech and common forms, of course. Class power, in essence: the legitimation of bourgeois rule. The Nobel Prize in Literature has existed to protect this refined category of expressivity. It has celebrated the humanizing, imaginative, individualizing, enlivening, ennobling, non-commercial, non-materialistic ways of seeing. Attached to all this is a subtle critique of more popular culture and groupthink, even as the books it prizes — precisely through the distinction of being better than merely commercial — sell far more copies than they would have otherwise. The most important thing for the Nobel Prize in Literature and attendant commentary is invariably the inherent quality of “the writing itself,” and the heightened — usually inward, psychologized — exploration of universal themes. Consider Ishiguro. The Remains of the Day is one of Jeff Bezos’s favourite books. He claims it is the foundation of his “regret-minimization framework” and helped him to find the courage to start Amazon. If he has noticed that the novel is about how class subordination ruins people’s lives, he hasn’t said so. The heart of the novel is the protagonist’s — and before him, his father’s — dependence on waged work. The story traces the process by which we begin to lose the ability to separate ourselves from our professional roles. It was published in 1989, and its concern with the subsumption of life by work was clearly occasioned in part by the circulation of images of the 1980s corporate crunch, with all those people working so much they forgot how to “really live.” It also denounces the British imperial project’s dependence on classed relationships: how much of the empire’s daily operation depended on people feeling that they didn’t have a right to object to their employers’ imperatives, or better, couldn’t fathom how to find another source of wealth that would allow them to say no? Bezos wants new Amazon employees to do what Stevens never does: live life to the fullest, seize the day. He means that they should do all this at work, of course. Or, more accurately, he can assume there is no distinction for those he hires: work is life, life is work. Real leisure will just make them better employees, as will the feeling that they are pursuing their passions in all things. Bezos is glad to think that what Ishiguro’s novel fears has come to pass: the person and person-performing-at-work are now one. His use of the novel as a corporate management tool proves how easily a “follow your heart” mantra can be recuperated. Bezos isn’t reading Ishiguro right, of course. The novel concludes with a lament about precisely such recuperation. Stevens has been reading too much into Miss Kenton’s (now Mrs. Benn’s) letter; she won’t come back to Darlington Hall with him, and the love story is over. So, he plans to return to work, the only difference being that he will now practice “bantering,” which his new American employer would enjoy. This bantering for him symbolizes de-sublimation, freedom from constraint — a certain “human warmth,” he calls it, which he now admits he lacks. It is precisely by operationalizing the injunction to “enjoy life” that he will be able to keep working. It’s a tragic ending. Much of Ishiguro’s other work is equally rich in commentary on specific facts of social life that inhibit human flourishing. Never Let Me Go (2005) considers how we literally consume other bodies for our own pleasure and prosperity, and how powerless art is in the face of such obscenities. The Unconsoled (1995) is about “affirmative culture,” to use Herbert Marcuse’s phrase: art is avidly consumed by an appreciative audience of people who appear to be in no way actually changed by it. Yet in discussing Ishiguro’s win with journalists, Sara Danius describes his style as a mix of Jane Austen, Franz Kafka, and “a little bit of Marcel Proust.” The emphasis is on literary tradition and style, a roster of distinction. The official announcement states that the prize goes to someone who, “in novels of great emotional force, has uncovered the abyss beneath our illusory sense of connection with the world.” A familiar literary topic: psychic turmoil, our illusions, an introspective abyss. Whose illusions? What world, exactly? It isn’t stated. The New York Times writes that, “in selecting Mr. Ishiguro, the Swedish Academy, which has been criticized in the past for using the prize to make a political statement, seemed to focus on pure literary merit.” The opposition couldn’t be clearer: there is politics, and there is merit, and these things can occasionally come together in fruitful ways but they have no inherent connection. Now what about the more particular contemporary conditions informing prize decisions? It is hard to make empirical claims on this score, precisely because the behind-the-scenes aspects of evaluation are never disclosed. We are supposed to take what is chosen for acclaim as simply what is self-evidently the best that is available in literary expression. But we might guess that the Nobel Prize in Literature wants to stay relevant at a time when the conditions integral to literature’s flourishing — and liberalism’s dominance — are no longer in place. First Bob Dylan, a celebrity singer, then Kazuo Ishiguro, an international superstar who so anticipates translations into dozens of languages that it informs his writing style (Rebecca Walkowitz calls his writing “born translated”). Many people who haven’t read his books are familiar with the film adaptations. These choices perhaps signal a certain awareness of the contraction of the high-cultural field. To select more obscure and difficult writer would at this moment signal an unpalatable irrelevance and elitism. The literary industry is, in general, in a period of profound self-reflection and transformation. Some are circling the wagons, accepting that literary products and events are for a dwindling elite, and some are attempting to accommodate an audience that is younger, less white, and what we could call differently literate. They are differently literate because of a stagnant economy that is slowly collapsing the high-literary establishment, which was built around an educated and socially climbing readership and fair number of relatively decent livelihoods for literary professionals. The issue is diminishment of official institutional supports for ongoing cultivation of the literary sociolect — supports like state-backed higher education, library provision, arts and culture funding for individual creators. Consider Penguin Random House’s move to relax the requirement that their employees have advanced degrees, as they recognize that higher education in the arts is becoming less and less accessible to people who aren’t wealthy and disproportionately white. Gestures like these are efforts to transform the corporate culture to increase sales, and they also flatter an institution’s self-image by suggesting some will to address the industry’s whiteness and perpetuation of elite cultural power. The Nobel Prize’s recent choices may reflect a similar will. Ishiguro is palatable to people who thought Dylan wasn’t literary enough, but he is also globally accessible to a middlebrow audience that hasn’t had a lot of training in cultivation of the literary disposition. They are not conceding that the whole literary establishment may depend upon modes of socialization whose availability and relevance are disappearing before our eyes, but they are prizing someone widely known and easy to read. They are also, we might surmise, flying in the face of the anti-immigrant racist right gaining force in the post-Brexit UK and beyond. The Nobel committee may explain Ishiguro’s win by referring to the eternal verities of literary acclaim — the elevated individual affording us insight into a private psyche staring into the abyss! — but to halt our own inquiries there, or simply debate if another writer deserved it more, is to assume and prop up the authority of this institution of assessment. Sarah Brouillette is a member of the Department of English at Carleton University in Ottawa, Canada. She is the author of Postcolonial Writers in the Global Literary Marketplace (2007), Literature and the Creative Economy (2014), and a forthcoming book about the history of cultural policy.